With a consultant for Benderson Development getting traffic studies underway for the firm’s proposed Siesta Promenade project, questions remain about whether the Sarasota County Commission is following the appropriate steps in considering the mixed-use development for a Critical Area Plan (CAP). 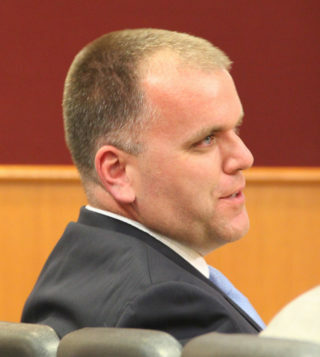 Kimley-Horn and Associates of Sarasota is continuing to serve as the firm’s consultant in undertaking the studies, he confirmed. Mathes said the timeline largely will depend on county staff, as it must review the materials Benderson provides it and then determine whether more work is necessary. He added that it is impossible to predict how much “back-and-forth” will ensue. A Jan. 25 staff report to the commission indicated that the staff review would take 30 to 45 days. To comply with the commission’s stipulations for the scope of work, a study of weekend traffic during peak tourist season was planned for Saturday, Feb. 18, Mathes pointed out. All the traffic analyses will involve the road segments and intersections the board approved on Jan. 25, he added. The traffic data collection was expected to continue through February, Mathes said. “From there, we’ll produce the report.” He added that he anticipated that to happen before the end of March. Traffic congestion has been the predominant concern of residents and business owners in the vicinity of the approximately 24-acre Siesta Promenade site. The property is on the northwest corner of Stickney Point Road and U.S. 41. 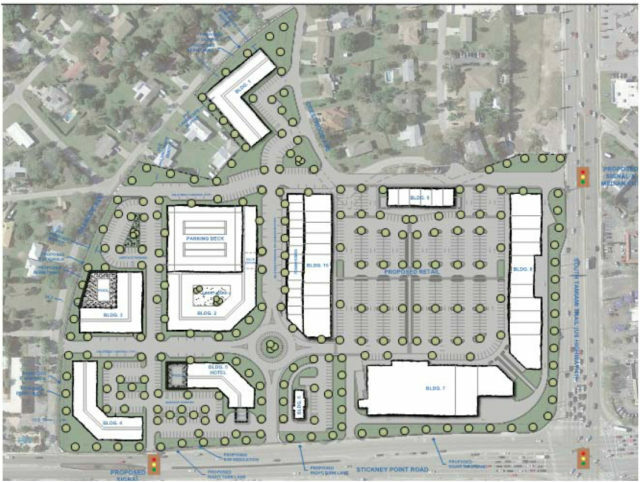 Benderson’s application — submitted in August 2016 to the county’s Planning and Development Services Department — called for up to 140,000 square feet of retail space, a 150-room hotel and 501 multi-family dwelling units. The CAP designation would allow density up to 25 units per acre, instead of the standard 13 units per acre allowed under Commercial General zoning, county Planner Todd Dary explained to the County Commission on Jan. 25. Benderson also has requested a special exception to allow buildings to be constructed as tall as 85 feet. Mathes has explained that the residential structures and the hotel would be on the western side of the property, with commercial uses along U.S. 41. 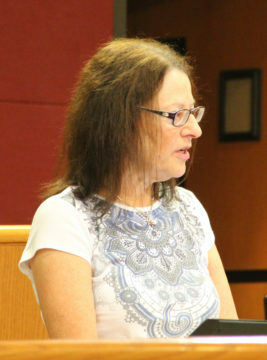 During the Open to the Public portion of the County Commission’s regular meeting on Feb. 15, Sura Kochman, a leader of Pine Shores Estates residents fighting the Siesta Promenade plan, reprised a concern she raised on Jan. 25. 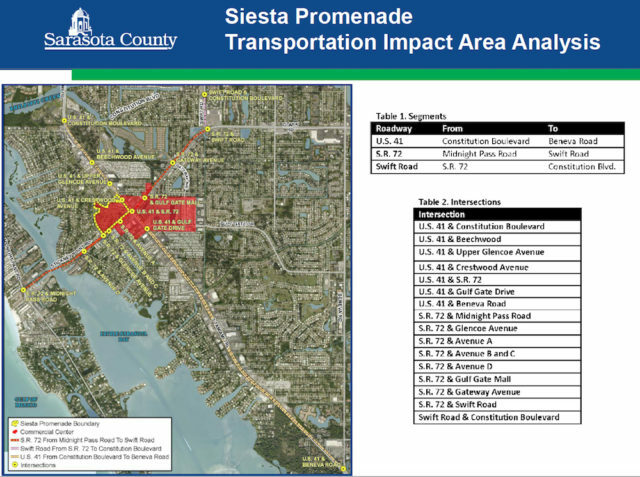 Citing a chart from the county’s webpage outlining the Critical Area Plan process, she maintained that a boundary should be established before the Siesta Promenade proposal goes before the Planning Commission. Kochman gave each board member a copy of the document before she stepped to the podium. Instead, the commissioners agreed to consider the boundary, the rezoning of the property and the CAP all in one public hearing, after the Planning Commission has voted on those issues. Kochman added that, based on the Jan. 25 discussion, staff will schedule the Planning Commission hearing after it has determined that Benderson has complied with all the requests under the scope of work. She noted that at one point during discussions about the boundary, Commissioner Charles Hines made the comment that no one knew what it would end up being. “There are a number of stakeholders who have an interest in this,” Kochman continued, “especially businesses south of Stickney [Point Road], because [the Florida Department of Transportation] will likely close the median cut at Avenue A,” which intersects with Stickney Point Road. The Pine Shores residents also will experience significant impacts if the project is constructed as proposed, she told the board. Pine Shores abuts the Siesta Promenade property. Commissioners traditionally do not respond to public comments, unless a speaker raises a point that prompts one or more of them to seek a response from staff. On Feb. 15, none of them addressed Kochman’s remarks after she left the podium. During the Jan. 25 meeting, Brian Lichterman, who served as a senior planner with the county for 22 years, also advised the board members they were in violation of the county policy by allowing the Siesta Promenade application to proceed as staff had suggested. He told the News Leader in an interview after the commission discussion that he had been involved with more than 30 Critical Area Plans. It was on the basis of that expertise, he added, that he had recommended to the commissioners — during public comments that afternoon — that they set a boundary for Siesta Promenade that encompasses all four quadrants of the Stickney Point Road/U.S. 41 intersection. 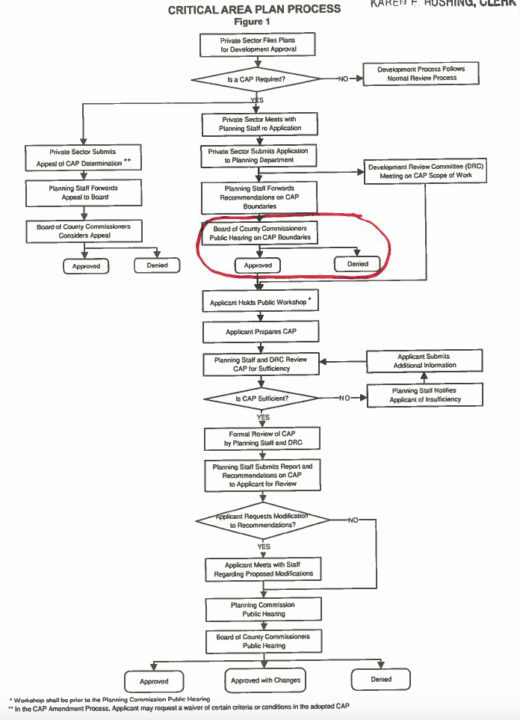 The CAP process, Lichterman pointed out to the board, was intended to create a comprehensive planning tool to address area-wide solutions in regard to future land use, compatibility, transportation, traffic circulation, cut-through traffic, walkability, drainage, utilities and urban design.